The Danby Beverage Center is a great purchase and can be used for more than just beverages. It’s very stylish with a sleek look and will compliment any home decor. It’s built of quality materials and performs excellent. It’s holds a nice temperature and keeps your drinks nice and cold. 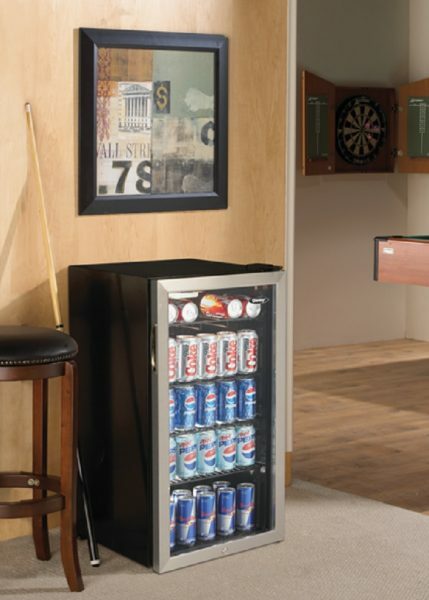 Aside from holding your favorite beer or soda, the beverage center can also hold anything else you’d like to keep cold. You can use yours to store things like beer, soda and chip dip. It can be used for a game day fridge, a dorm room fridge, or anything in between, the possibilities with the Danby beverage center are endless. Of course, you can use it anyway you’d like. If you use it for beverage storage only, you can fit five 24 packs of cans into this beverage center, that’s enough beer for a weekend bender for me (just kidding!) – but there is plenty of room to store all your favorite drinks! Tip: The more you store in the fridge, the less the fridge has to work to keep things cold (this goes for any refrigerator or freezer). The Danby Beverage Center <- click for sale price! looks and performs great as a stand alone unit. You can use it next to your sofa, on top of your counter (if you have the space), or anywhere you think it’ll look good! The measurements are 20″ deep by 18″ wide” by 34″ tall. It has reversible door hinges so it will work whether you need the door to swing left or right. One reviewer on Amazon recommended purchasing an LED bulb to replace the incandescent bulb that comes with the beverage center, that way you can use the little switch in the lighting compartment to keep the light on all the time (and save energy too)!